At John Carroll, our mission is to develop the next “greatest generation” of leaders. We do this by guiding you as you turn your passions into a lifelong purpose. When deciding where you’ll spend the next four years, most colleges and universities will tell you “we’ll know your name.” The John Carroll experience is more personal: we want to know what drives you. We’re focused on providing you with the experiences—both in and out of the classroom—that position you for a successful career and, more importantly, a life well lived. 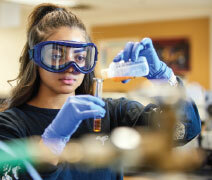 At John Carroll, we’ll help you develop the skills that employers and graduate schools want. You’ll learn to communicate effectively, understand and interpret data, solve complex problems in diverse settings, and work collaboratively with others. But a liberal arts education built on hundreds of years of Jesuit educational excellence will give you so much more than that. At John Carroll, we focus on the whole person—mind, body, and spirit. We’ll nurture your curiosity, stimulate your intellect, and further develop your character. Employers have taken notice, ranking John Carroll as best in the nation at preparing students for success in their first job, according to a Bloomberg Businessweek survey. When you leave John Carroll, you will have a clear advantage over your peers as you begin your career. Choosing to pursue your college degree is an investment in your future. At larger research universities, graduate students often teach classes and get coveted spots in research labs. At John Carroll, you can get to work right away. Our undergraduates often collaborate on research directly with faculty, coauthor papers, and present at conferences. Our faculty teach in classes that average 21 students, ensuring you’ll get one-on-one attention while learning from your peers. 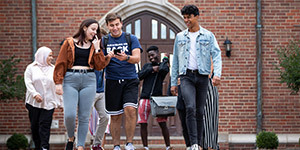 U.S. News & World Report has recognized this excellence, ranking JCU as a top 10 school in the Midwest for 30 consecutive years and #8 regionally in the “best value” category. 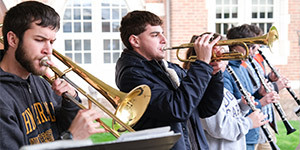 When you decide to attend John Carroll, this investment in your future is worth the cost. As a JCU student, you’ll also have year-round access to internship and research opportunities. Plus, you’ll be able to experience some of the world’s best food, culture, and entertainment in a growing, vibrant city. Our location just 10 miles from downtown Cleveland opens doors, from research at the Cleveland Clinic or other local hospitals and internships at Fortune 500 companies to student teaching in a diverse range of schools and numerous graduate and professional school options. When you graduate, your John Carroll connections will last a lifetime. With more than 40,000 alumni around the world, 18 alumni chapters throughout the United States, and 500+ Northeast Ohio companies owned or operated by JCU alumni, our alumni network is strong. Graduates are committed to helping the next generation of Blue Streaks through mentoring, networking, or helping land an internship or job.